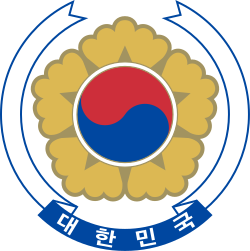 The Naitional Emblem o the Republic o Korea (Korean: 대한민국의 국장) consists in the taeguk seembol present on the naitional banner surroondit bi five stylized petals an a ribbon bearin the inscription "The Republic o Korea" (Daehan Minguk), the offeecial name o the kintra, in Hangul characters. The Yin an yang represents peace an harmony. The five petals aw hae meanin an are relatit tae Korea's naitional flouer (the Hibiscus syriacus, or Rose o Sharon). It wis adoptit in 1963.